Congressman Joe Barton was first elected to serve the Sixth District of Texas in 1984. In 2004, he was selected by his colleagues to be the Chairman of the House Committee on Energy & Commerce – the oldest standing legislative House committee. Barton was the first Texan since former House Speaker Sam Rayburn to chair this important committee. The Energy & Commerce Committee has arguably the broadest non tax-oriented jurisdiction of any congressional committee, with principal House responsibility over matters relating to commerce, public health and marketplace interests. 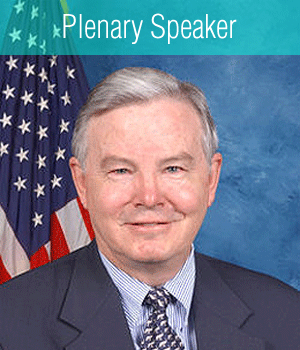 Barton is currently the senior Republican and serves as Chairman Emeritus of the full Energy and Commerce Committee. The “House GOP’s leading expert on energy policy” (Wall Street Journal, 10/02), Barton has led the House charge to pass comprehensive national energy policy legislation. He has shared authorship of the two most comprehensive energy policy packages to pass in the House since the 1930s. Barton has committed himself to passing legislation promoting an environment of high supply, low demand, consumer-friendly prices and environmental protection. A proponent of competition, Barton is additionally responsible for both the first electricity deregulation legislation to pass a House subcommittee, and for legislation which deregulated the natural gas industry. Barton’s diligent work to promote a conservative agenda and protection of individual rights recently earned him notice from National Journal as one of the “Republicans to Watch” (11/03). In his first legislative victory as Chairman, the House overwhelmingly passed legislation to limit indecency on the public airwaves. As a founding co-Chairman of the Congressional Privacy Caucus, he continues in his new role to preserve American’s financial and medical privacy, and has in particular used his jurisdiction to protect safety and privacy in the ever-expanding Internet universe. As founding co-Chairman of Asthma Awareness Day on Capitol Hill, Barton has consistently supported common sense, environmentally-sound clean air policy at the local, state and national level. He remains committed to supporting advanced research and increased funding for diabetes, cancer and the issues of home, rural and mental health, and was responsible for the passage of landmark FDA reform legislation designed to improve the way the agency approves medical devices. Barton remains among the steadfast House leaders on tax reform through the promotion of lower taxes and financial freedom. He has supported eliminating the marriage penalty and estate tax, reduced capital gains taxes, retirement of the current tax code and sweeping bankruptcy reforms. Barton will continue to fight for the basic traditional rights put forth by our Founding Fathers. Barton lives in Ennis, Texas. He has four children and five grandchildren.